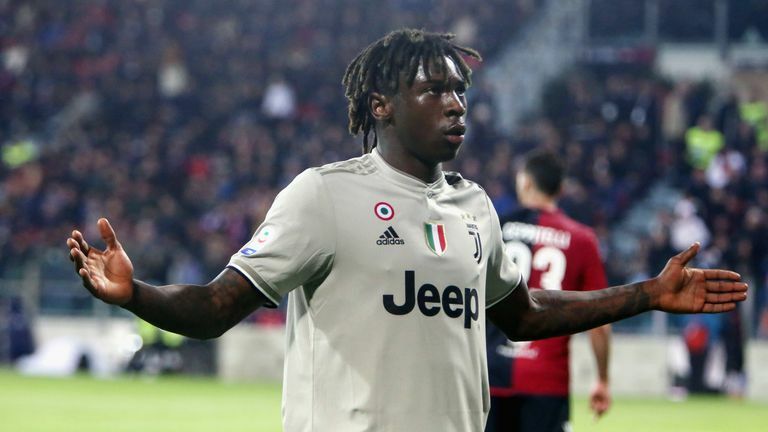 Moise Kean took a stance of defiance to the racist abuse he received against Cagliari after scoring in the 2-0 win. The teenager stood at the post, his arms aloft in response to the chants. Juventus manager Massimiliano Allegri felt that the teenager should not have responded to the racist chants - but called for the "idiots" responsible to be handed lifetime bans. "We need to use the cameras, find those who are doing it and punish them. It's very simple, identify them, and not one-year ban or two, just give them a lifetime ban. Juve team-mate Leonardo Bonucci also said after the match his team-mate should not have provoked the home fans. The defender said: "There were racist jeers after the goal, Blaise heard it and was angered. I think the blame is 50-50, because Moise shouldn't have celebrated like that, and the Curva should not have reacted that way. Juventus players, led by captain Giorgio Chiellini, had protested to referee Piero Giacomelli, who was also in conversations with both managers. Cagliari skipper Luca Ceppitelli went over to the fans behind the goal, appealing for the chants to stop, while France midfielder Blaise Matuidi appeared to gesture to Allegri to take his players off. Kean, whose goal added to Bonucci's towering header in the 22nd minute, was handed a start by Allegri at the Sardegna Arena with Mario Mandzukic laid low by illness. He had impressed when finding the net against both Finland and Liechtenstein for Italy, before then following it up with the winner over Empoli after coming off the bench. In the other Serie A match on Tuesday, AC Milan drew 1-1 with Udinese.